Similar to the site for the stairwell installation, the location of the light in the dining room light is exposed. The chandelier is surrounded by windows and can be viewed from multiple vantage points and distances. It can be seen from the entryway, kitchen, and living room, as well as across the courtyard from the master bedroom. From outside, it can be seen from the courtyard, grilling area, yard, and pool. The wide, softly stained wooden planks on the floor were one of the first things that caught my eye. This reclaimed barn wood makes appearances on the floor and walls both inside and outside the house. Like a fingerprint, their prominent wood-grain patterns served as a unique identifier for the home. I wanted to lift these prints off the ground in the dining room and incorporate them into the chandelier for that room. One of the design pillars that emerged during the Discovery Phase was the experience of viewing natural light pouring in from above while standing in a darker space below. This evocative, almost spiritual, effect is reminiscent of a ray of light bursting through the clouds. 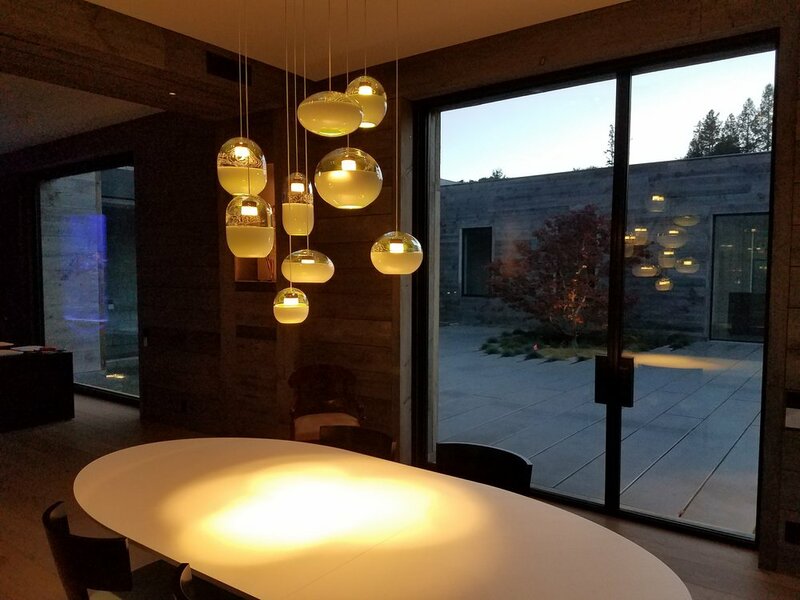 I wanted to play off of the architectural features throughout the home that activate natural light in this way while designing the glass components for this piece. Encalmo is the technical name for adhering two glass cups of different colors together, while hot, to make a two-toned vessel. I was captivated by the ascending light phenomenon throughout the house and began envisioning an encalmo object with one clear half and one opaque half. 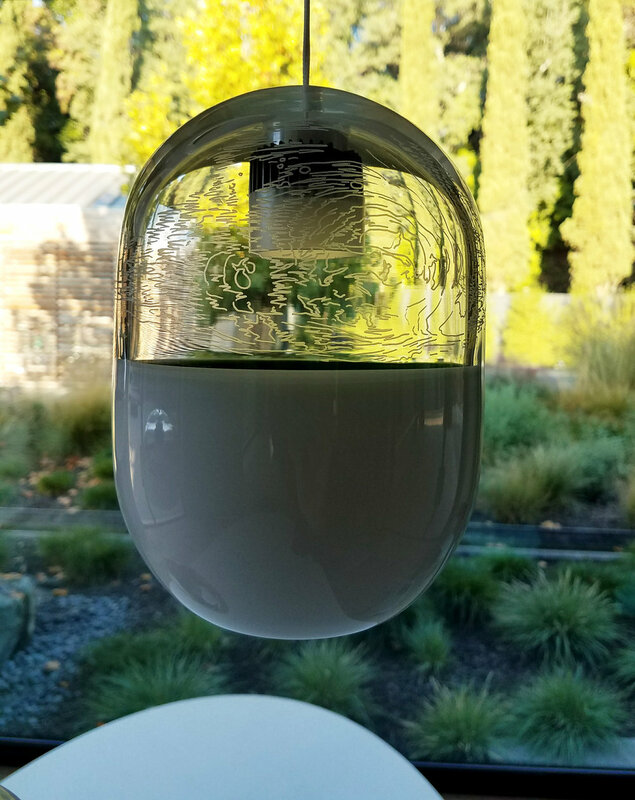 The opaque half would be white on the outside with a hidden green interior only visible from below when you are sitting at the dining table. The specific green I selected with my clients plays off the garden outside the windows of that room. During my reflections, I also studied other architectural examples of directing natural light in this powerful way. Flipping this object so the clear is facing up drew an even stronger connection to one of my architectural inspirations, the Pantheon. Building scale models out of foam is an important part of my process. For this piece, creating a model allowed me to experiment with the arrangement of glass parts and drop lengths until it felt resolved. My goal was to create an intentional but freeform composition, which was tricky given the range of sizes and forms needed for this piece. Once confident with the model, I brought it to the house, hung it there, and lead a collaborative feedback session with my clients. We observed the model from all the key views, and I made slight modifications before starting the final fabrication.